Chick peas are cheap, bland and readily available. Like your average Big Brother auditionee. But dressed up in masalas, they’re quite another story. They are delicious and so easy to cook. I found a fantastic Atul Kochhar recipe for lamb in chick peas in the BBC’s Olive Magazine. Line three of the recipe said something about soaking the chick peas overnight so it’ll have to receive the QIC treatment before it can apear on this blog. When I make chana or chick peas, I used the ready cooked variety, the type soaking in brine in a lurid coloured tin. But the tin doesn’t matter, it’s what on the inside that counts. 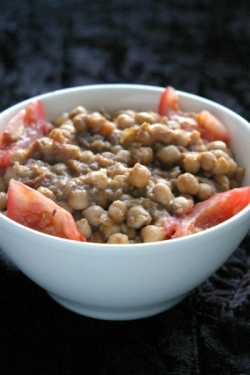 I tend to cook chick peas as a super easy side dish to a meat preparation and dhal. You can decide how much gravy you want in it. Normally it should have a soupy gravy but my hubby likes it drier. Heat the oil and when hot add the chopped onion. Fry on a high heat for three minutes until it is translucent. Then add the ginger and garlic and fry for another five minutes until the whole mixture starts turning brown. Add all the masala powders, bar the garam masala. Fry for five minutes on high and then add half a cup of water. The masala mixture will bubble up. Let it cook until the water dries up. Then add the chopped tomato and fry for five minutes until the tomatoes disintegrate. When they do, lower the flame and simmer for 5 minutes until you can see the oil coming out from the sides of the mixture. It may not come through little holes in the mixture because of its thickness. When the oil shows up, add the rinsed chick peas. Give it a good stir, add the remaining water, the garam masala powder and simmer for 15 minutes until you can see oil appearing on the surface of the gravy and the mixture starts smelling of chick peas rather than pungent masalas. Add salt to taste. OMG,heavenly! I am eating with a spoon, LOL! Over the last couple of years I have been slowly learning how to cook Indian food one recipe at a time, thanks to you and your blog. I’m a vegetarian but lack a lot of cooking skill so your instructions and recipes are soooo helpful. Plus I love your witty persepctive on so many things! Thanks! The recipe is nice but you din’t mention how much chana masla is needed. in the end you just mentioned put chana masala. How much? great recipe, really simple too!! Delicious! Thanks for this and all your recipes. You’re a great resource for a budding cook! this recipe is rubbish…i dont think the other comments are real as everything burn in the pan! !…you cant put that many dry ingredients into a pan and cook on high for the ammount of time suggested without everything burning…really rubbish recipe!!! actuallystumbled upon a blog page definitely worth browsing.